Hi friends. 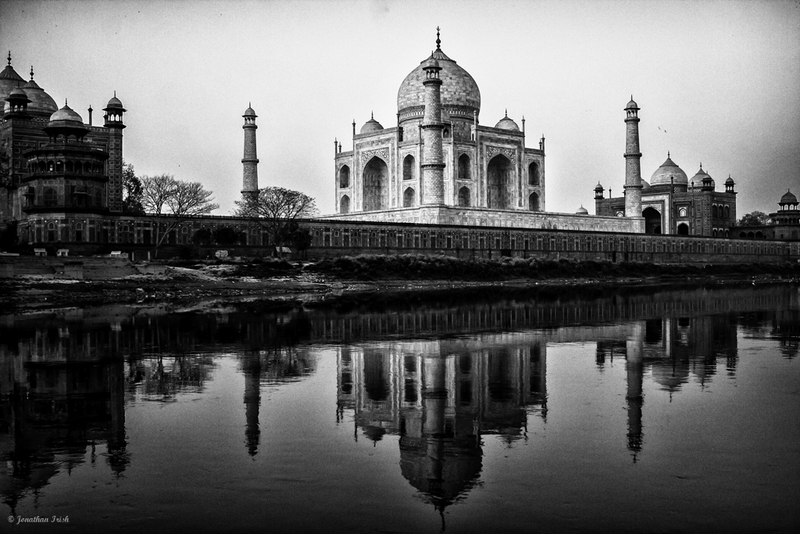 Today I share with you a Black and White photo of the iconic Taj Mahal, in Agra India, taken from the Yamuna River. Built by the Mughal Emperor Shah Jahan in memory of his third wife, Mumtaz Mahal, The Taj Mahal is often referred to as the greatest monument to love ever built. An incredible architectural feat completed in 1653 that is now a designated UNESCO World Heritage Site, one should be sure to not miss this incredibly beautiful white marble mausoleum. The Taj Mahal from the Yamuna river, built by Mughal emperor Shah Jahan in memory of his third wife, Mumtaz Mahal. UNESCO World Heritage Site. Agra, India. Arjumand Bano Begum was christened by Shah Jahan as Mumtaz Mahal, meaning the “Jewel of the Palace“. As many as 28 different varieties of semi-precious and precious stones were used to adorn the Taj. The Taj Mahal attracts 2-4 million visitors annually, over 200,000 from overseas. I love this image…it almost looks like a drawing to me (which is partly what I love about it). I struggled whether to post this in Black and White or in color. In truth, the color version is just as beautiful, but in a different way. The warm early morning color of the sun gave the Taj a beautiful pink glow, which is totally lost when it is in Black and White. And yet, something about this image…the texture and the lines……draws me to post it in black and white. I guess it comes down to personal taste…I just love Black and White photos. What about you? This was not an easy shot to get by any stretch. I knew that I wanted to get a different perspective of one of the most photographed sights in the world. But it’s hard (not impossible, though) to get that shot where EVERYONE else walks (i.e. within the Taj complex). So what do you do? Think outside the box. While at the Taj, I walked to the very back of the walled-in complex and noticed the Yamuna river flowing behind and thought to myself, “Now, if I could get out on that water, that would be a much better photo.” I thought I noticed a little house and a small oar boat down the river, and felt pretty confident I could find my way to it. So I put a plan into action: I’d come back even earlier in the morning the next day (about 5:30 or 6 a.m.) and would not get in line to enter the Taj complex, but would rather walk to the Northern side of the complex along the outside wall and try and find the owner of the little boat whom I would offer some moulah to take me out on the river for an hour or so. (On a side note, some people don’t like to pay for things like this while traveling, but a few dollars here and there will really make a big difference not only in the shots you get but also the lives of the locals. Just don’t go overboard or pay too much.) And what happened? It all worked out smoothly…I found the owner and worked out a small charge for him to row me out on the river and hang there for an hour while the sun came up. It was not only a tremendous photo opp, but also a very peaceful and serene way to experience the Taj (away from the crowds). As I’ve said before, you gotta dig and really work a subject to get a great photo….so next time you think you got the shot, ask yourself how you can improve upon the shot by looking at the subject outside the box (or in this case, outside the complex). 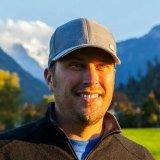 Jonathan Irish is a seasoned travel photographer who has traveled to over 65 countries and specializes in photographs of people, landscapes, abstracts, and, above all, cultures abroad. His work has appeared in various National Geographic publications, and he is represented by National Geographic's Image Collection www.NationalGeographicStock.com/jonathanirish. When he is not traveling the world in search of amazing photos, he gathers inspiration from the other great photographers at National Geographic, where he is the Program Director for National Geographic Adventures Jonathan lives in Washington, D.C.
18 Responses to "The Taj Mahal in Black and White"
Nice story, and inspirational too. I'm sure those few bucks you spent of the row boat were repaid at least ten times. So true, a few bucks to get the amazing shot can come back ten fold. its really antic to see black and white. Wow! What a truly amazing shot! I have never been to the Taj Mahal but I guess I will have to book a flight for India soon! Nice shot and great thinking to hire a boat. When I was at this site the police had closed off the beach to tourists and didn’t let me get to the spot I wanted. I had to improvise too but didn’t even think to hire a boat. Frustrating to wake up at sunrise and not get the shot you thought you were going to, but like you said sometimes you have to think outside the box! Usually Taj Mahal is captured from the front so it’s nice to see a different angle of the world famous location. Nice shot, Jonathan! Absolutely gorgeous! I love that you took the time to get this shot. So many times when we travel we see the beauty, but don’t take the time to make sure our photos capture the beauty in the way we saw it, and just snap a random shot. It’s always great to see a fresh perspective on such an iconic structure. Thanks for sharing. This gives me a great idea when I finally get to visit India. Fun fact: There were supposed to be two Taj Mahals. One white, one black, representing heaven and hell, facing each other from opposite sides of the river. I think it would have been great. But at least we have one. Don’t worry, you are not alone. The black Taj Mahal was never made. This shot was meant to be B&W! Stunning – probably the best TM shot Ive ever seen. Love the photo and the background information around the effort required to get to a great/different spot.